You are likely to spend more time in your home than you are anywhere else on this earth. And because you’ll probably spend such a large majority of your time there, you need to be sure your home is just about the most beautiful and the safest place there is. And to make your home every bit that beautiful and safe, you can’t go wrong with quality landscape and security lighting! 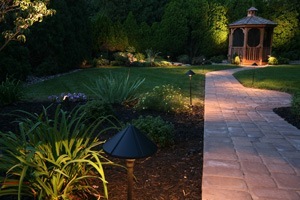 With landscape lighting, you can enjoy a mini light show in your garden every single day after the sun goes down. And with security lighting, you can be sure to catch any unsavory characters prowling about your property in the middle of the night. If you want to enjoy this unparalleled beauty and safety, then be sure to call on your local San Antonio electricians at John Jones Electric for quality landscape and security lighting! From installation to upkeep and even repairs and replacements, we have all the know-how needed to ensure you enjoy security lighting your whole life long! But curb appeal is something you’ll concern yourself with only at the end of your time in your home. In the interim, you’ll focus more of your attention on a far more pressing concern: security. Your home should be, as we said, one of the safest places you’ll go to. And with security lighting, you can be sure that your home will be just as safe as can be! One of the most unnerving threats to your well-being is prowlers who slip onto your property in the dead of night when shadows keep their presence unknown to you. Don’t want to stress over potential unseen prowlers? Then call up the local San Antonio electricians at John Jones Electric to provide you with security lighting! With security lighting, prowlers won’t have the shadows and secrecy they need to get the jump on you. Thus, you’ll get to enjoy unparalleled security in your home! And after enjoying this safety through the years, when it does come time to sell your home, your security lighting will provide one last benefits: a higher price tag for your home. When people shop for a new home, they look for security as well as anything. And with the top-notch security that security lighting provides, you can command the highest price tag possible for your home -- and people will gladly pay. Looking to enjoy the most beautiful and, more than that, the safest home possible? Then call on the local electricians at John Jones Electric. We can make your home every grain as beautiful and as safe as you could want it to be thanks to our landscape and security lighting work!